Reduces Delay to 0 for all castles for 15s when activated, once only. Reduces Delay to 0 for all castles for 20s when activated, once only. 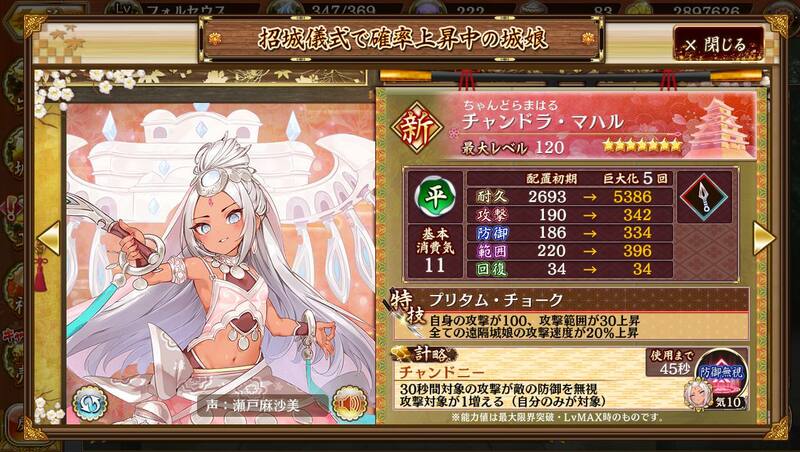 ※ 「月光の短剣」 can be obtained from [Crafting], Warehouse Drops, and Affection Rewards. ※ Can only be equipped by Plains Castles. 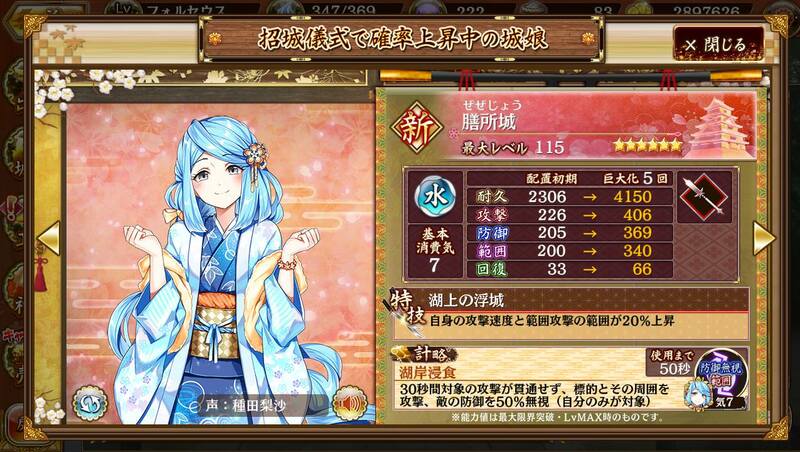 ※ 「孔雀の門」 cannot be obtained from [Crafting], or Warehouse Drops. Fixed a bug where collaboration characters' voice lines would play at a constant volume regardless of the options settings. All users who have logged in before 10/30 (Tue) at 10:00 will receive [1x Spirit Orb] in their present box as compensation. ■ [Added Bonus] for 1000 & 5000 DMMpt Spirit Orb First Purchase! During the campaign, purchase the 1000 or 5000 DMMpt Spirit Orb package for the first time to receive bonus Spirit Orbs. 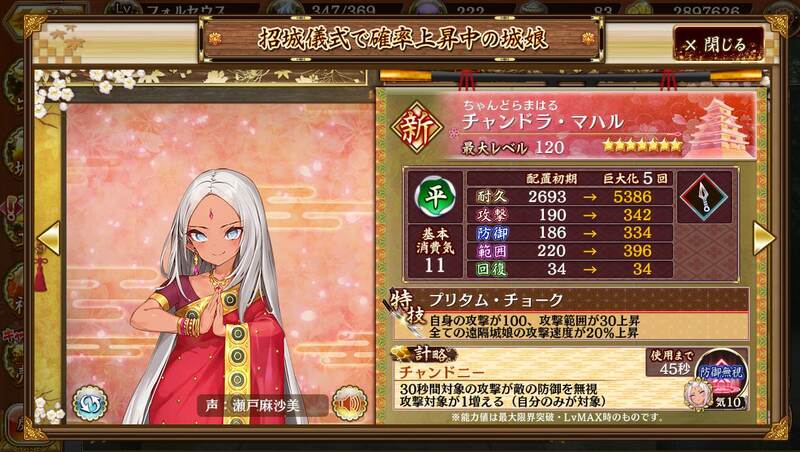 Furthermore, the 1000 DMMpt package will include Chandra Mahal's image weapon ★4武器「月光の短剣(投剣)」. The 5000 DMMpt package will include a [Six Star Prayer Stone] which guarantees a ★6 Castle, and 2x Tsubasa [Toku] which gives a very large amount of EXP to level up a castle. ■ [8 Step Gacha] begins! During the campaign, receive wonderful rewards for every 10x gacha you do with the 8 Step Gacha! ■ Returning Event [War God Advent! Maeda Toshiie] begins! After the 11/6 (Tue) maintenance, the high difficulty event [War God Advent! Maeda Toshiie] will return. Completing the special conditions can award you with the ★4 Facility 「石川門」. The 90 AP quest, the mecha deer hit quite hard, I think it has a gimmick, don't try to block it right away. It will go wander, move out of the map and return again later toward the middle warehouse. Hopefully you already setup strong defense by then to intercept it. Other than that, watch out for enemy coming from the north will go directly to Tono. 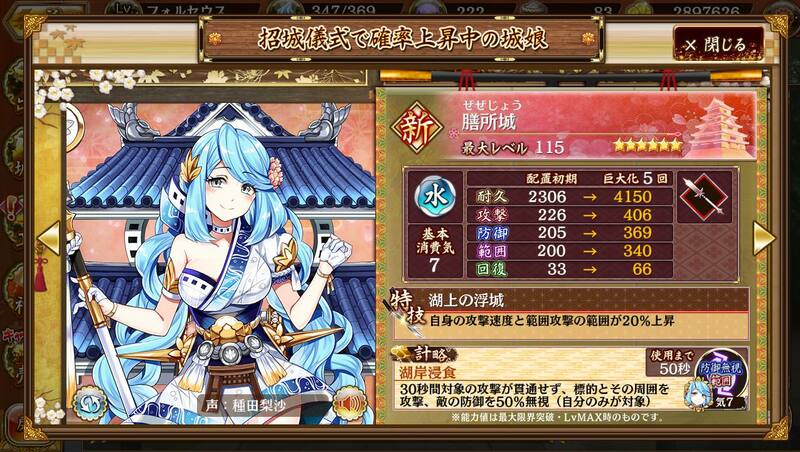 The Shiromusu on top of the building, I think is buffing the enemies, not sure what. Careful if you try to take her out, she's an archer and will shoot back, it's quite painful. After several failed tries, I ended up ignoring her and focus on setting up my defense first and go back to her later about mid game. Last edited by Mikan; 11-01-2018 at 06:22 AM. What is the chance the 4* hammer castle drop from event in 45 stamina mode? 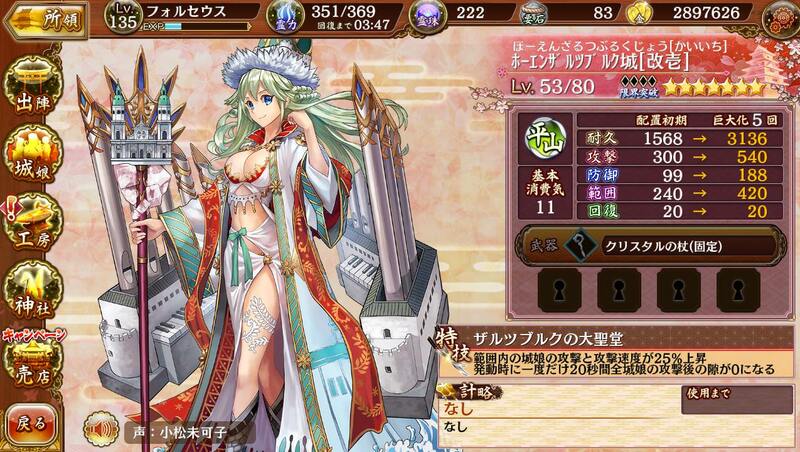 I know increasing in each run but sometimes drop a 2* and somtimes 4* event girl. If 2* dropped is reduce 4* drop chance too or they count as paralel? The more Shiromusu of mine grow, the less the thrill I get. 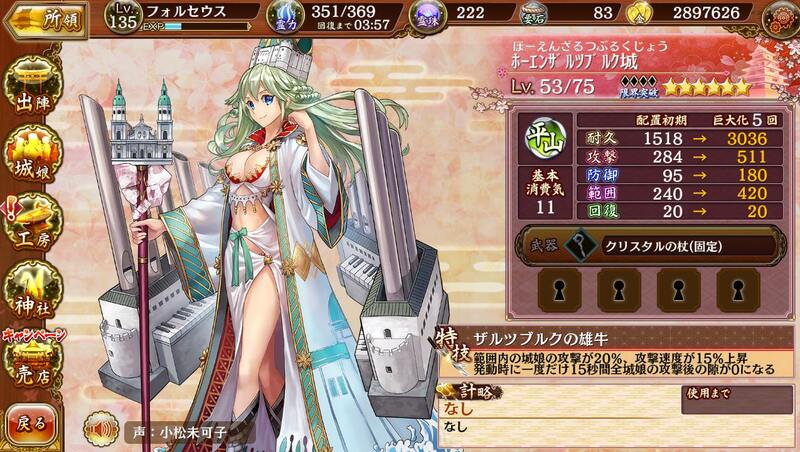 I think my Shiromusu mature enough to handle War God Advent! About the Mecha Deer, is this deer evolution #2? Can't wait for Elephant mk2!